In the right eye there are retinal and preretinal haemorrhages, cotton-wool spots and vascular sheathing. A 21-year-old male presented with floaters in his right eye. An otherwise healthy 21-year-old male student from Bangladesh presented with sudden onset of reduced vision and floaters in his right eye. He was not taking any medications. Examination showed reduced vision of 6/18 on the right (OD) and 6/6 on the left (OS). In the right eye there were vitreous cells, retinal haemorrhages, pre-retinal haemorrhage from retinal neovascularization, cotton wool spots and sheathing of retinal vessels (Figure 1). The left eye was normal. Atypical features of this vein occlusion are the young age of the patient and the absence of vascular risk factors. The presence of vitritis and vascular sheathing suggested an inflammatory cause. 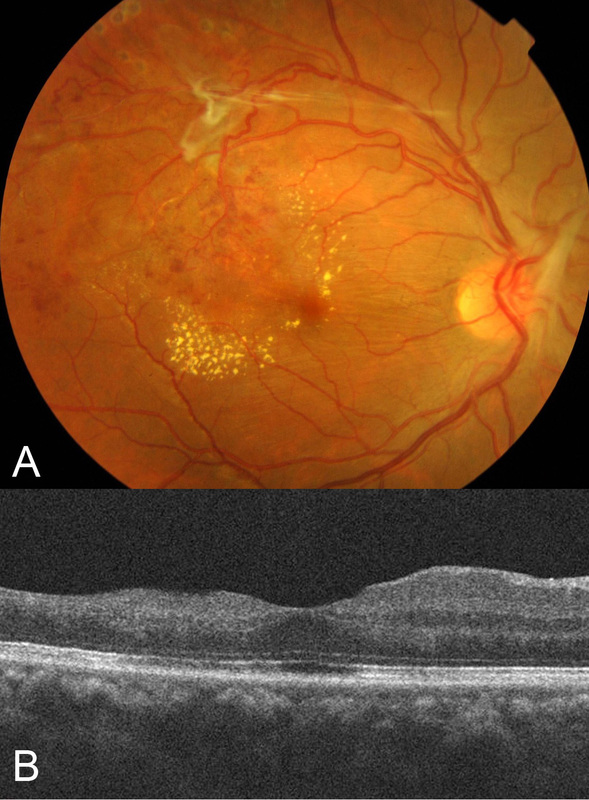 Fluorescein angiography showed an ischaemic BRVO with retinal neovascularisation and peripheral retinal ischaemia (Figure 2). There was late fluorescein leakage at the macula and optic disc. 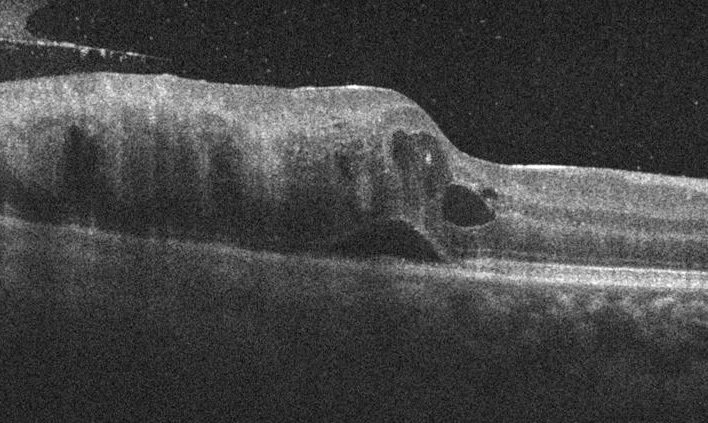 Optical coherence tomography (OCT) showed moderate cystoid macular oedema at the temporal margin of the fovea (Figure 3). Fluorescein angiography of the right eye. A) In the venous phase, the following can be seen: blocked fluorescence from retinal and preretinal haemorrhages, hyperfluorescent retinal neovascularization along the superotemporal arcade and hypofluorescent capillary drop-out. B) A neovascular frond is also present supernasal to the optic disc. 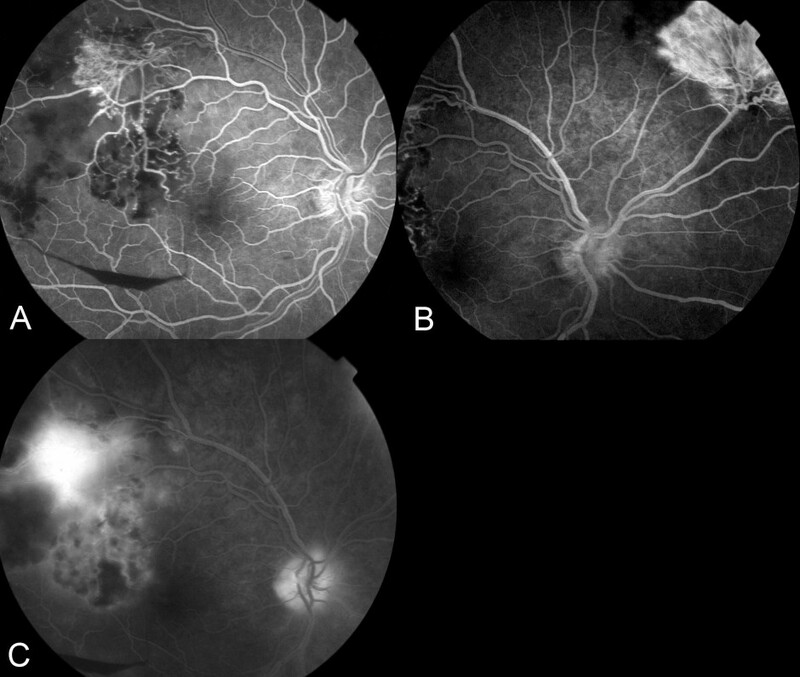 C) In the late phase angiogram, there is leakage of fluorescein dye (increasing size and intensity of hyperfluorescence) from the retinal neovascularization. There is also some hyperfluorescence of the optic disc consistent with an inflammatory cause and angiographic macular edema. Optical coherence tomography of the right macula. Cystic oedema is present just temporal to the fovea. Investigations (FBC, UEC, fasting BSL, lipid profile, syphilis serology, ACE, HIV serology, ESR, CRP, rheumatoid factor, ANA, ANCA, hepatitis serology and chest X-ray) were ordered looking for an underlying inflammatory cause to the BRVO. As the patient was from a tuberculosis (TB) endemic area (Bangladesh), a Quantiferon Gold TB Assay was ordered and returned positive (TB specific antigen 0.77IU/ml, mitogen 1.55 IU/ml). The patient was promptly referred to a respiratory physician who felt that the probability of latent TB was high. Full anti-tuberculous medication (9 months of rifampicin, ethambutol, isoniazid and pyrazinamide) was prescribed. Oral prednisone (75mg) was commenced in addition to the anti-tuberculous treatment to stem the inflammatory drive. Scatter argon laser photocoagulation was applied to areas of ischaemic retina. Despite this, a small vitreous haemorrhage developed from the retinal neovascularization. With further laser and a slow taper of his steroids the patient made good progress with resolution of the retinal vasculitis and macular oedema and improvement of the vitreous haemorrhage (Figure 4). Two months after commencing treatment, the vision improved to 6/9 OD. Two months after commencing treatment, the vision improved to 6/9 OD. A) There is regression of the retinal neovascularization and reduction in the retinal and preretinal haemorrhages. In the top left corner of the photograph, pigmented scatter argon laser photocoagulation scars are visible. B) On optical coherence tomography, the cystoid macular oedema has resolved. Retinal vasculitis can cause significant visual loss if not managed appropriately. Where there is peripheral retinal ischaemia, scatter argon laser photocoagulation is indicated to prevent vitreous haemorrhage. Infective causes of vasculitis need to be ruled out as immunosuppressive therapy without treating the underlying infection can worsen the infection. One should have a high index of suspicion of TB in patients originating from endemic areas. Collaboration with physicians is required for the treatment of TB uveitis. 1. Anonymous. Risk factors for branch retinal vein occlusion. Arch Ophthalmol 1993;116(3):286-96. 2. Yoaum DJ, Ha MM, Chang Y, Song SJ. 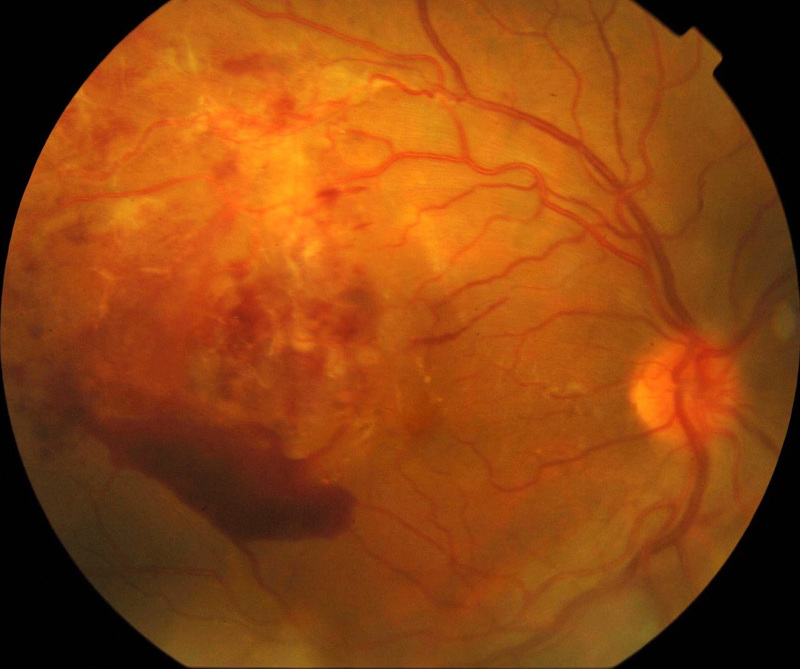 Retinal Vessel Caliber and Risk Factors for Branch Retinal Vein Occlusion. Curr Eye Res 2012; 37(4):334-48. 3. Tabbara KF. Tuberculosis. Curr Opin Ophthalmol 2007;18:493-501. 4. Helm C, Holland G. Ocular tuberculosis. Surv Ophthalmol 1993;38:229-251. 5. A Gupta, V Gupta: Tubercular posterior uveitis. Int Ophthalmol Clin. 2005,45:71-88.